Panel Members’ length of office is one or two years from the date they first take office. Scheduled Elections take place each year in order to fill the seats becoming vacant in that year. The current SEC Panel is listed in the documents section on this page. The SEC Panel’s prime objectives are to ensure that the SEC is effected in a way that is efficient, within the SEC Panel’s terms and conditions and fair and does not discriminate between Parties or classes of Parties. The SEC Panel is required to conduct its affairs in an open and transparent manner, act independently and without undue regard to the interests of any related person and act in a manner designed to facilitate the performance by the SEC Panel of its duties under the SEC. In accordance with Section C8.11 – C8.13 of the SEC, in January of each year the Panel are required to set out a draft budget for the following three Regulatory Years commencing thereafter. Following consultation with Parties and Panel approval, the Draft Budget is published on the SEC Website to become the Approved Budget 15 Working Days thereafter and become effective on 1st April of that Regulatory Year. The Panel budget sets out the Panel’s good-faith estimate of the Recoverable Costs that it anticipates will be incurred during the relevant Regulatory Years. 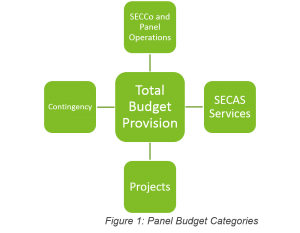 The Panel set their budget using four categories as shown in Figure 1. The Approved Budget for the Regulatory Years 2019 – 2022 can be found below. This has an effective date of 1 April 2019.